The recently completed Ordos Museum in northern China is just the latest in a long line of stunning buildings in the planned city. 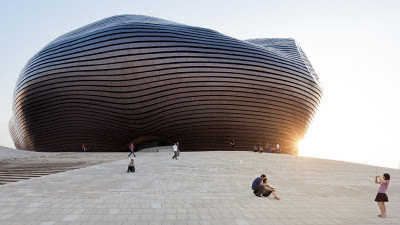 Designed by Beijing-based MAD Architects lead by the visionary Ma Yansong, the structure takes full advantage of both natural light and ventilation. Although the city itself is still struggling to take off, one things is for sure...the museum is a striking reference to the land and culture of the region, as well as a guidepost to the future.